From the late 1970s through the 1990s, I worked in women's history - Texas women's history, with the great, late historian Ruthe Winegarten, and a sizeable group of other women who collectively formed the Texas women's history project and its successor activities. We had a thrilling time collecting artifacts for a major museum exhibit, and data and stories enough for many articles and books (many in fact still being written). One thing that experience taught me, however, was that women have not been leaving enough documentation of their/our activities, for the historians to come. That's one reason that a book like Feminists Who Changed America is very important. It provides a starting place for looking for who was involved in the movement, where they came from and what they accomplished. The book includes 2,250 entries, almost all of them written by the subjects themselves, but subject to the guidelines and promptings of the editors. Compiling this book was clearly a labour of love, and also one that must surely have required a vast store of patience and forebearance, in working with so many strong-willed authors to set down their own contributions to women's history, mostly in 1/3 of a page or less. As I dip into the book at random (unfortunately, it's too large to keep on the back of the toilet), I learn more about old friends and heroines. Here's Allie Hixson, for example, who has volunteered almost full-time to try to get the Equal Rights Amendment to the US Constitution passed (nope, it's not in there yet!). Turns out she has a doctorate in English but was denied a full-time teaching position because she was a woman. Thinking about the Equal Rights Amendment, I try looking up Sissy Farenthold, who got the Texas Equal Legal Rights Amendment finally introduced and passed in the early '70s, when she was still the only woman in the Texas House of Representatives. Probably she was too modest to write her own bio. I have to say here, in the interests of full disclosure, that I am one of the subjects in the book, and probably one of the tardiest and hardest to work with. My biggest problem was that I was being asked to write about my own accomplishments, but almost all my accomplishments as a feminist have been co-accomplishments with other women. Barbara required me to reduce this contextualization in the interests of space and conformity, and to a degree I complied. The internal dynamics of creating the book must have also been fairly strenuous. Besides Barbara Love as the Editor, there were 31 other women working at one or another editorial level, 3 researchers, 19 advisory board members, a 3-member outreach committe with its own chair, an indexer, ten photographers whose work is included on the cover and in a 16-page black and white photo essay, a web technician, a graphic designer, and an office administrator. Looking in the book for the biography of its editor, I find that Barbara Joan Love was born in 1937, that she joined the US National Organization for Women (NOW) very early - in 1967. She published a book called Foremost Women in Communication in 1970, and went on to be part of the Lavender Menace and work on lesbian and gay issues. She co-authored one of my favourite early books on the lesbian feminist movement, Sappho Was a Right-On Woman (1972). She was also an early matriarchalist and futurist, and despite all this managed to be appointed by the White House as a New York delegate to the 1977 National Women's Conference in Houston. 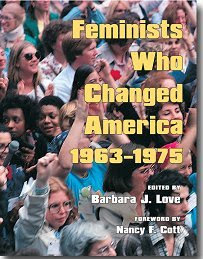 The project for Feminists Who Changed America was done in collaboration with the Veteran Feminists of America. Also, the introduction by Nancy Cott is quite short and slight - a few notes on the etiology of the women's movement, decribing it as "fragmenting" into many smaller groups. I would have chosen a different term - feminists who emerged during this period all owned the feminist movement in different ways and defined it for themselves, applying it at the grassroots and personal level, and not mainly in national organizations. Professor Cott is a professor of American History at Harvard and has a book out from Yale Press titled The Grounding of Modern Feminism (1987), which goes into depth on the subject of how modern feminism came to be. I expect a lot more can be written about what it became starting from the data provided in Feminists Who Changed America. The biggest structural handicap of Feminists Who Changed America from the point of future history writers is that the index isn't really an index - just a list of the names of the women mentioned with the pages they are on, so you can't for example search by organization or newspaper name if you've forgotten who the founder or the editor was. My best suggestion is that this is a project that was perhaps done in the wrong medium. While it makes an impressive book (and an expensive one), it would have much more scope and utility as a web-based cache of knowledge - it would be automatically searchable and also more easily expandable for the stories that didn't get finished by the deadline. It's my hope that once Barbara Love recovers from making the book she will recover her futurism and consider a move into the 21st century medium. Meanwhile, you can help her recover what she spent out of her own pocket to put this book together, by ordering a copy and getting your library to do the same. It will speak volumes (well one volume anyway) about your politics when you have it on your coffee table - and with its large comfy size and water-resistant cover, it will also make an excellent and symbolic chair-booster for the toddlers you'd like to see standing on their foremothers' shoulders by and by. It's $80 US (but you get a discount if you're in it). I am an intern from the University of Arizona Women's Resource Center. I wanted to let you that we love your blogs! We wanted to share your blog with our members and community, would you do the same for us by linking the Women's Resource Center? Please help us increase our visibility as a center! Thank you for all that you are doing for women everywhere!